My husband and I became interested in the mid-century design era about five years ago. Our interest initially stemmed from a Craigslist post my husband found for a Milo Baughman for James Inc. model 74 recliner. He became a little obsessed with finding one. Eventually we found three of them! There are several iconic aspects of the period that we both admire; from the sleek tapered legs found on wood furniture to the rich, colorful upholstery fabrics, there really is a lot to recommend the furniture pieces. The open interiors, abundant windows, indoor/outdoor spaces, low-pitched roof lines and many other aspects of the architecture make the houses timeless and almost universally appealing. We are avid thrift shoppers and appreciated the fact that we could find vintage pieces at very reasonable prices. We began to keep an eye out for items we could replace in our home with vintage pieces. As time progressed, we found we had a penchant for collecting lamps, art, pottery, ashtrays and chairs (so much so that we wound up housing far too many in a storage unit). There is an inherent affinity within us both for the history of these objects which fuels our desire to buy them and give them a new life in our home. We now live in a 1970’s ranch that has a few MCM features like a plate glass window, sunken living room and flagstone entryway. We have replaced most of the light fixtures with vintage ones. We have a home filled with the treasures we have accumulated. Our entire home is furnished with vintage furniture, lamps, art and decorative objects. 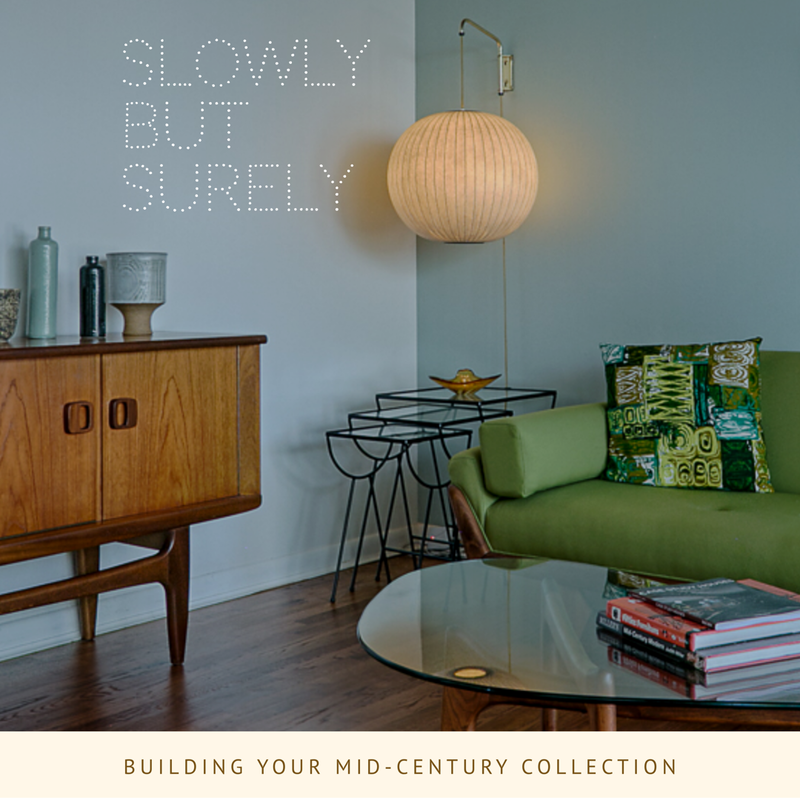 There are many publications and internet sites that make it seem like living in an authentic mid-century styled home is unobtainable or cost prohibitive, but we are proof that with time, persistence and the willingness to make it your own that you can have the mid-century dream, too.